SPX has said that it may be a relatively new name in pumping solutions for the oil and gas industry, but brands within it have over 100 years of expertise and experience in the industry. In 2007, Clyde Pumps was formed through the acquisition of Weir Pumps. 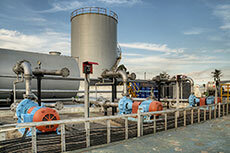 A further merger with Union Pumps formed the ClydeUnion Pumps business, which was acquired in 2011 by SPX. This rich heritage is displayed by the ClydeUnion Pumps brand, which provides engineering pumping packages and has decades of expertise in serving the oil and gas industry. Within the ClydeUnion Pumps product portfolio is the CUP-BB5 range of multistage, radially split barrel pumps. These pumps, designed against the latest API 610 oil industry specification, boast comprehensive hydraulic coverage and a long history of proven successful performance in the field. CUP-BB5s are engineered in a variety of configurations to suit the application and customer needs; from opposed or inline impeller arrangements; volute or diffuser based hydraulics, foot or centreline mounting, and material construction options from carbon steel to super duplex; all features considered to achieve an optimum pumping solution. The advanced design of the CUP-BB5 includes other key features such as the pioneering Shear Ring cartridge locking system, which enables rapid withdrawal of all the pump internals as a cartridge without disturbing connecting pipe work. This greatly reduces the time required to maintain the equipment compared to conventional methods. Sophisticated sealing options designed to meet the API 682 standard, include a patented double mechanical seal system which is available to ensure safe operation when pumping aggressive or toxic fluids. A stiff rotor design provides maximum hydraulic efficiency, extended mean time between overhauls and reliable operation. 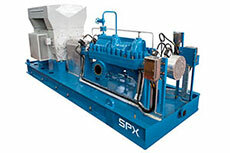 Through its ClydeUnion Pumps brand, SPX has vast experience in often arduous offshore and onshore oil and gas environments. These highly successful CUP-BB5 machines are used extensively throughout the production, transportation and refining sectors, covering such diverse applications as high pressure water injection, liquid pipelines, boiler feed water, and hot hydrocarbon refinery services. SPX solutions are supported throughout their lifetimes and come with truly global support to ensure customers get the best service from front end engineering through professional supply and project management to comprehensive aftermarket lifetime services. The ClydeUnion Pumps brand is known for providing high performance, reliable and safe pumping solutions with products and designs based on decades of leading service to the oil and gas industry. The CUP-BB3 pump is an axially split, multi stage, double volute heavy duty pump designed for high pressure and high speed service. ClydeUnion Pumps, an SPX brand, is celebrating 100 years in the oil and gas industry.